Horses with a round-the-clock feeder that allows them to eat whenever they want some forage. Horses appear to be hungry nearly all the time. Horses that have the luxury of being in a pasture spend most of their day taking a few steps, grazing, taking a few more steps and grazing again. In fact, in their natural habitat, horses spent the day and much of the night moving from place to place, eating as they went. This grazing pattern not only provided the necessary nutrition, but also provided needed exercise. A horse's digestive system is both complex and sensitive. With a relatively small stomach, a horse needs to eat small amounts often and the feed eaten needs to contain a high percentage of fibrous material to ensure safe passage through the complex digestive system. A horse needs 2 to 3.5 percent of its body weight in feed each day. In other words, a horse that weighs 1,000 pounds needs 20 to 25 pounds of feed each day. The amount may vary depending on the kind of hay, the amount of grain or commercial feed given, and the horse's activity level. 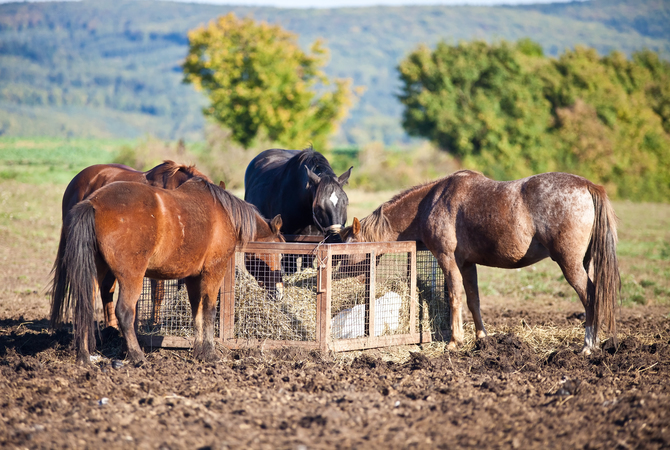 When it comes to feeding your horse, different horses of different ages and in different physical conditions have different nutritional requirements. Selecting the best feed for your horse may be as simple as getting suggestions from your veterinarian and researching the kinds of hay and other feed available in your particular area. Generally, hay makes up the greater part of a horse's diet. Hay is good feed because it provides roughage along with the nutrients and keeps the horse's digestive system working well. In addition, it satisfies the horse's natural urge to chew. Generally a legume such as alfalfa mixed with a grass such as timothy is considered to be a good choice for feeding most horses. Of course, some grazing in a pasture, if at all possible, along with supplemental hay can be the best of all worlds for the horse. Some horses need concentrated feed, especially if they have respiratory problems or have trouble keeping on weight. Hay cubes which break apart quickly are good for these horses as well as for older horses that have problems chewing. Many commercial feeds are available for horses and have been formulated to meet specific needs of horses. These feeds usually come in pellet form and are often mixed with molasses, vitamins, and other supplements to meet the needs of young, or older horses, very active horses or horses that have problems keeping on weight. Bran, in small quantities is also a good food for horses. Too much bran is not good for your horse because it may result in an impaction, especially if the horse doesn't drink sufficient water. A bran mash before a long trailer ride may help prevent colic. In other cases, the a few cups of bran may be mixed with chopped up carrots or apples and a small amount of grain and fed to your horse. Some veterinarians recommend adding fat to the horse's diet especially if the horse is worked consistently and has problems maintaining weight. Half a cup to a cup of vegetable oil may be added to grain or other supplemental feed if your horse needs the additional fat in its diet. Grain is a high-energy feed for horses, especially those that are involved in racing and other equine athletics, and can be invaluable for horses that are pastured in extremely cold weather and need an addition source of energy to keep warm. Oats, barley, and corn are healthy grains that may be fed alone or mixed with a small amount of molasses. A serving of one to two cups makes a nice occasional snack for your horse or a daily snack for a horse that need to put on weight. Vitamins and minerals are necessary for good health. Horses should have free access to a mineral salt block and you should consult with your veterinarian about whether or not your horse needs supplemental vitamins. In addition, your horse will enjoy treats such as pieces of apple and carrots cut small enough to prevent choking. Providing a good supply of clean, fresh water for your horse day in and day out is extremely important. Your horse needs it to stay healthy and to stay alive. If the weather is cold or the water becomes icy, a heating element to warm it slightly should be used. A horse should drink eight to twenty gallons a day depending on the climate and the intensity of exercise. Watering troughs are often used to satisfy the horse's thirst. An automatic watering system that replenishes the water once it falls to a certain level may be installed. If not, you will need to check the water level in the trough and refill it whenever necessary. If it is a rather large trough that holds a good supply of water, checking it morning and evening may be sufficient. One advantage to using a watering trough that you are filling is that you have a good idea of how much water your horse is drinking. This information is helpful when you have a horse that appears to be ill. Horse supply stores have a variety of watering systems that can be installed in stalls, barns or wherever a horse needs to get a drink. Many of them are automatic and dispense fresh water automatically when a float system falls to a certain level. All watering troughs and dispensers should be checked often to make sure that no algae is building up and that no water contaminants are present. A good periodic scrubbing will keep them sanitary and prevent bacteria or other harmful conditions from developing. During cold weather, horses will drink more water when it is heated to a comfortable drinking temperature. If drinking water is too cold, it may have detrimental effects on the health of horses, especially those that are old, very young, and those that have compromised health.